Smoking and Medical Oxygen: What’s a Landlord to Do? Landlords face a bad choice. 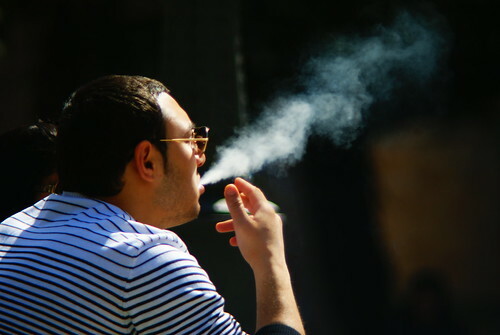 If they stop tenants from smoking around medical oxygen, they’ll face claims of breach of contract, handicap discrimination, and violation of civil rights. If they ignore a known danger, and someone gets hurt, they may be liable. Oxygen isn’t flammable, but it accelerates fires. In an oxygen-rich atmosphere, an ember—like the one on the end of a cigarette—will burst into flame. If you are using oxygen equipment for a respiratory problem—as smokers often must—the gas will seep into your clothes and hair. The consequences can be dire. If it’s so dangerous, why not make it illegal? The answer is that they’ve tried. The Board of Fire Prevention Regulations has considered the problem and always stepped away from it—partly because the Commonwealth’s ban on public smoking does not apply to residences, private clubs, churches, hotel rooms, and in some cases even nursing homes. There’s a reluctance to ban oxygen users from these places, when smokers are allowed. So what we have instead is a PR campaign, which started in January, where the fire marshal says bluntly, “Do not allow smoking inside of a home where oxygen is used.” Nonsmoking tenants will put the landlord on notice and demand a response. Then it’s up to individual building owners and management companies to enforce that prohibition or risk being sued for negligence when their invitees—literally–light up. Some public housing authorities have banned all smoking, as the city of Boston is planning to do. But that’s not easy for a private landlord. First, it’s a restriction the lease didn’t contain when the tenant signed it. A smoker could say it’s a breach of contract. Second, it’s not easy to rent apartments these days. Tenants might move somewhere where they can poison themselves and stink up their apartments in peace. The third alternative is to promulgate a policy. But what would that say? You can’t tell, from the hallway, whether the oxygen is on when someone is smoking. And the danger remains even after the oxygen has been turned off. That means you have to ban all smoking and open flame in apartments where oxygen generating equipment is used, whether or not it’s turned on. Smokers will say the rule violates their civil rights. “I didn’t fight in World War II so I could be told what to do in my own apartment,” a tenant of one elderly housing complex said to me during a discussion of the landlord’s new policy. Condo owners will feel even more strongly about being told what they can do in the units they own. It’s not hard to formulate a response to the claim of a vested right to smoke in one’s home. I’ve looked in the Constitution, and I can’t find a fundamental right to set fire to your neighbors. Smokers are not a protected class, and smoking is not a disability. See Brashear v. Simms, 138 F.Supp.2d 693, 695 (D.Md. 2001); 42 U.S.C. § 12201(b). Tenants will probably say the new rule is a material change in the terms of the lease they signed when they moved in. They’ll say they relied on those terms when they left their former homes or apartments—where they smoked at will. If a landlord wants to wait until the lease renews, he can insert an appropriate provision into the new lease. But waiting, in the face of a known danger, may not be an option. Any decent apartment complex lease has a provision that allows the landlord to promulgate rules that are not inconsistent with its terms. And it probably has a general prohibition against acts that cause or threaten to cause physical harm or hazardous conditions to others. A bit thornier is the claim of discrimination. “My rights are being stepped on,” a tenant said to me. “I’m disabled. I need oxygen. And there’s nothing outside to sit on. I’m getting it both ways.” Having emphysema or some other respiratory illness meets the definition of a handicap, because it interferes with major life activities. If only handicapped tenants are forbidden to smoke in their apartments, they will say the rule is discriminatory. They are being denied a privilege afforded to every other tenant. The landlord would be well advised to enter into a dialog with the tenants to see what, if any, accommodation is reasonable. The best the landlord can do is to create an outdoor space, which is not enclosed, where people can smoke. He could designate a covered area near the building where tenants can stay out of the rain and sit comfortably as they pollute the air. But they’ll have to leave their oxygen tanks behind. Joel originally published this story in Massachusetts Lawyers Weekly on April 26, 2010.